Wet Trout: Las Vegas Day 2: August 5, 2013 It's BBQ Time!!!!! Las Vegas Day 2: August 5, 2013 It's BBQ Time!!!!! Today we hatched a brilliant plan to win millions in Vegas. Ok, you're right. We didn't. But we did decide to use the rental car and check out some spots made famous by television. Well, famous to an extent. More so now that we've visited them. 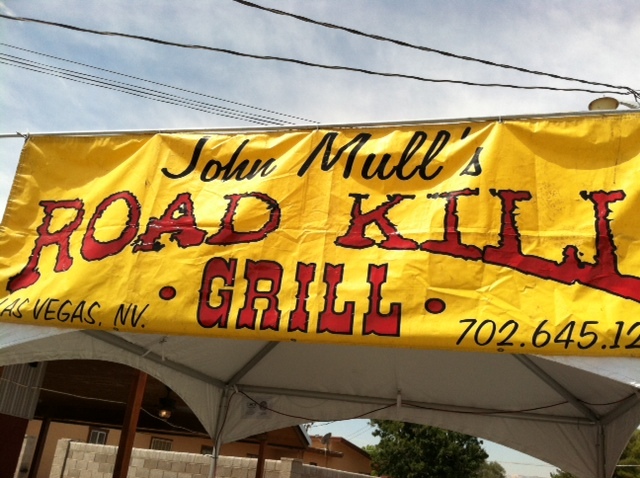 Our first stop was John Mull's Meats and Roadkill Grill which was on an episode of Food Network's Diners, Drive-In's and Dives. You'll need a GPS to get there. It's tucked into a little neighborhood way off the strip. It's one of those places you wouldn't find accidentally. 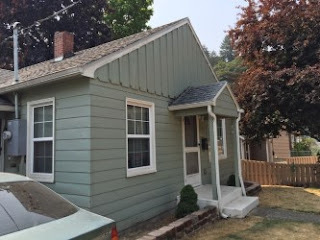 It's got some charm. A cute seating area complete with fans and misters (which you'll need in the Vegas heat), and a long covered walkway for the lines I hear you'll have to wait in on a regular basis. We arrived early...so no lines held us back. Which also meant we were a bit confused on which door to enter through despite the fact that one was aptly signed "Entrance". Walk in and you'll wonder if you haven't still taken the wrong door. Inside you are greeted by a tiny area that houses a butcher shop and steps away, a counter for ordering BBQ. There isn't room for more than maybe ten customers. All the seating is outside. We grabbed our grub and headed for the picnic tables. Pulled pork, brisket, ribs, sausage, mac and cheese and baked beans. 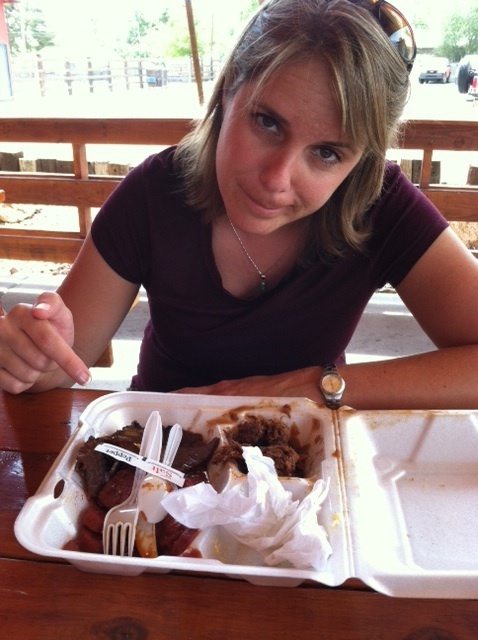 Lou and I were both so very excited to taste awesome BBQ. This was going to be the highlight of our Vegas trip. Oh how quickly dreams die with the opening of a food container lid (that was a fat joke, keep up people). Um, Guy (host of 3D's), I'm sure you know your stuff...but you WERE SO WRONG about this place. 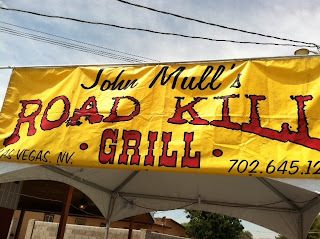 I don't claim to know BBQ (ok, well I claim it a little) but I do know that the BBQ cooking at John Mull's was a disappointment. Not just for me...my pal Lou didn't like it either. 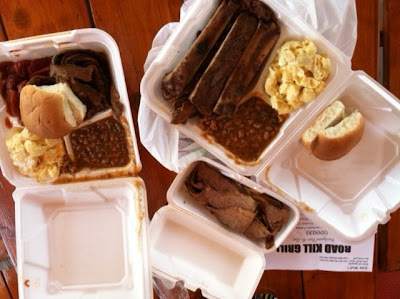 We ordered a huge assortment...ribs, pulled pork, sausage, and brisket with mac and cheese and baked beans. The reviews rocked. The food did not. This is probably good BBQ to some people. I found it flavorless. It was as if someone boiled all the meats and poured too much bland sauce on it and then slopped it on a plate and crossed their fingers. This was the first time in history that I've left MEAT on my plate. I swear, if I hadn't ordered pulled pork, I'd be wondering what that sloppy mess of congealed meat was on my plate. I'm not going to be too harsh. I mean, the sides ROCKED. The mac and cheese was delish..and the beans, though not what I'm used to, packed some great flavor. I wish the meat would have done the same. 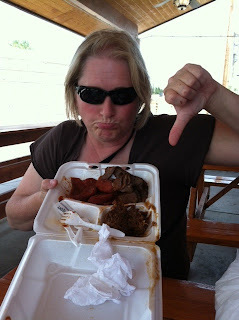 Or that I'd tested it before I ordered extra to take back to the hotel...which ended up in the trash. If you would have told me a week ago I'd be throwing BBQ away I'd have told you to shut your filthy mouth. Oh the agony. It's almost hard to admit I tossed pulled pork in the trash like a virgin throws away her morals at the prom. Where once bbq was on my fingers...."
That's all I came up with. Sorry, I'm distracted by all the sadness in my heart.